PBI-Gordon has developed new SpeedZone Southern EW Broadleaf Herbicide for Turf, a emulsion-in-water (EW) formulation. 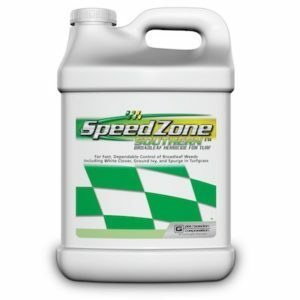 SpeedZone Southern EW offers a lower odor profile and lower volatile organic content compared to the original SpeedZone Southern, the manufacturer said. The EW formulation technology creates smaller particle sizes, helping improve efficacy by letting more active ingredients impact the leaf surface. SpeedZone Southern EW controls more than 70 tough broadleaf weeds, including dollarweed, ground ivy and spurge, and PBI-Gordon said it’s highly selective in established cool-season and warm-season turfgrasses. Designed for use on golf courses, residential and commercial areas, SpeedZone Southern EW is labeled for use in the most common turfgrass species, including centipedegrass, seashore paspalum, common St. Augustinegrass and zoysiagrass. This product is most effective when applied February through April, is rainfast in as little as three hours, allows for reseeding in one week and creates a visual response within 24 hours, killing weeds within seven to 14 days. SpeedZone Southern EW is currently in the registration process for use in the state of California. Registration is expected in mid-2019. In the meantime, PBI-Gordon will continue to manufacture and sell the original SpeedZone Southern formulation in one-gallon packages exclusively in California.